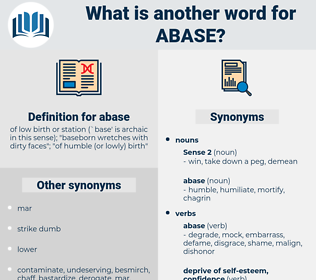 What is another word for abase? of low birth or station (` base' is archaic in this sense); " baseborn wretches with dirty faces"; " of humble ( or lowly) birth"
elevate, cherish, enhance, compliment, grow, value, extend, praise, laud, flatter, esteem, dignify, respect, exalt, expand, upgrade, raise, improve, promote, extol, increase, honor, build up. boast, cleanse, amend, acclaim, highlight, decorate, clean, cheer, clarify, purify, romanticize, ameliorate, hail, idealize, boost, uplift, recognize, applaud, fete, meliorate, perfect, acknowledge, congratulate, eulogize, salute, celebrate, tout, lift, spotlight, better, refine, cite, commend, enrich, play up, restore, advance. aphakia, apc, appose, abacus, apsu, avouch, apogee, abuja, apiece, abies, abkhas, abc's, apophysis, appease, aphasic, ABS, affix, apex, apsis, apiaceae, abscissa, abuzz, aphis, aphagia, apus, abuse, abkhaz, apache, apios, abash, abyss, abbess, abbacy, abscess, aphesis, abasic, apoapsis, aphasia, apis, aphakic, apophasis, apse, abscise, abasia, abcs, abaca, aves, abkhazia, apace, abc, apish. smash, take down, degrade, disgrace, put down, crush, demean. bruise, injure, spite, wound, offend, hurt.